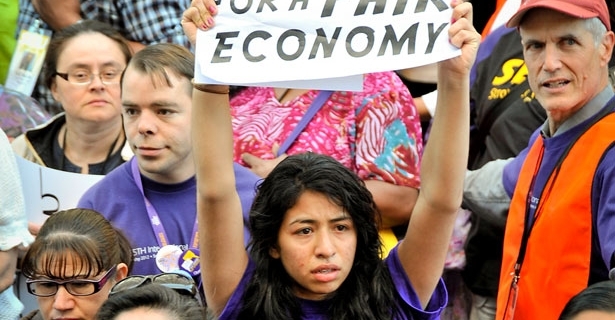 Protesters march on Wells Fargo during the 2012 SEIU Convention on May 29 in Denver. SEIU wants to lead a campaign against the 1%. Critics wonder if it can. Critics of SEIU leadership, from both inside and outside the union, caution that SEIU’s own track record is at odds with its professed plan to lead a movement against the 1 percent. For several decades, the Service Employees International Union (SEIU) has talked—and typically acted—more ambitiously than most American unions, especially about organizing and politics. It has succeeded and failed with those ambitions, bringing both creativity (such as the Justice for Janitors campaigns) and injury (such as the break from the AFL-CIO) to the cause of American workers and their unions. This initiative comes from an understanding that the labor movement—under attack and unable to grow—needs help to accomplish its goals. SEIU leaders say those goals range from electing real “champions of the 99 percent” and “changing the national conversation,” to creating a “surge” of popular and progressive action that will provide a fertile context for organizing more workers into unions. “Our union has to unite with a broad 99 percent movement to tackle all forms of social inequality, and we need to take primary responsibility to lead on closing the gap between the rich and everyone else,” SEIU President Mary Kay Henry told the convention, where she was re-elected after first having won an executive board fight in 2010 to succeed retiring president Andy Stern. “We can spark an organizing movement. What matters is that the 99 percent is ready to take on the power of the 1 percent,” she declared. Help get the word out about peace and justice issues and Military Madness. Click here to donate. Subscribe or “Follow” us. riseuptimes.wordpress.com. For the TC EVENTS calendar and the ACTIONS AND ACTION ALERTS click on the tab at the top of the page and click on the item of interest to view. Now also in a sidebar. WAMMToday is also on Facebook! Check the WAMMToday page for posts from this blog and more! “Like” our page today. But critics of SEIU leadership, from both inside and outside the union, caution that SEIU’s own track record—including charges of coziness with big employers, limits on internal democracy, excessive deference to Democratic party leaders and frequent clashes with other unions—is at odds with its professed plan to lead a movement against the power and wealth of the 1 percent. One example of this conflict between SEIU’s professed political ambitions and its actions occurred a few weeks after the convention. As an outgrowth of a controversial agreement to cooperate with the California Hospital Association, the 150,000-member SEIU-United Healthcare Workers West (SEIU-UHW) local tried—but ultimately failed—to line up legislative sponsors and labor movement “neutrality” for a management proposal to weaken the state’s law mandating a minimum ratio of nurses to patients. The state’s current staffing standards, which have been proven to significantly reduce patient mortality, are a prized achievement of the California Nurses Association (CNA). SEIU, however, said the hospitals—especially “safety net” institutions in poor areas—needed the economic relief that modifying standards for break periods would provide. CNA countered that the hospitals are financially healthy, and a rule change would destroy the staffing ratio and invite broader attacks on state laws on breaks in the workday. The California Labor Federation, except for two SEIU board members, unanimously opposed SEIU’s proposal. SEIU’s proposal also clashed with efforts by the National Union of Healthcare Workers (NUHW) not only to protect staffing standards for nurses but also to establish such standards for other hospital workers. NUHW is a new, rival union formed in 2009 when SEIU put the big California UHW local under trusteeship for resisting its order to turn over thousands of members to another local against the members’ wishes. In one case of reported collusion, workers at Kaiser hospitals testified before the National Labor Relations Board that management had helped SEIU defeat NUHW in a 2010 election battle between the two unions to represent 43,000 Kaiser employees. The NLRB found SEIU-UHW guilty of unfair labor practices, citing instances of management collusion in those acts, and ordered a re-run of the election, which may occur this year. The expensive, distracting fight in California, which in this case has led SEIU to line up with the 1 percent against its allies and members, is a tragic consequence of SEIU’s slow shift under former president Stern to more centralized control, less tolerance of open debate, frequent disregard of members’ sentiments, and negotiating overly deferential agreements with employers in order to more easily organize and grow the union. Many SEIU members and staff see Mary Kay Henry as more accommodating to varied views, but she has not departed sharply from Stern’s policies. Many unions, besides SEIU, try pressuring employers into agreements to remain neutral during organizing drives. Some global union federations have negotiated “framework agreements” with—mainly European—multinational corporations to respect workers’ rights to organize, such as the one UNI (Union Network International) negotiated with Securitas and G4S, two leading private security firms. Thanks to agreements like these, SEIU will organize 50,000 security guards over the next four years, according to National Campaign Director Scott Courtney. But SEIU and both firms have apparently negotiated confidential agreements that spell out the precise terms for implementing the global pact. In some previous secret agreements, such as a nursing home deal that former UHW leaders criticized, SEIU surrendered basic worker rights to assure management neutrality during organizing. Despite real successes in organizing hospital workers, especially in the HCA network, and security guards in 22 cities, even SEIU is finding organizing harder, especially since its rapid growth of home care members will slow. SEIU claims that since the 2008 convention, the union gained 250,000 new members (including 57,000 last year); however most of this growth has come through mergers and is about half the number Stern projected four years ago. Not all of the newly organized have contracts or pay dues, and many jobs have been lost in the recession. So the last federal membership report shows an increase from 2008 to 2011 of 65,000 members, to 1.92 million, making SEIU the second largest union in the United States. If SEIU hopes to mobilize a new movement against inequality, it could learn from its Minneapolis local, which brought together allies, developed a common political “alignment” rather than a loose coalition, and shared resources on all its projects (such as pressuring US Bank both to help the large Somali immigrant community to send remittances home and to drop its anticipated financing of a privatized immigrant detention facility). To be a champion of the 99 percent, SEIU will need to protect its own members’ rights, not compromise them to win employers’ favor. It will have to challenge politicians and corporations on the limits of the politically possible (as it failed to do in the 2009 health care debate when many unionists and progressives thought Stern was too ready to compromise and ally with CEOs like Lee Scott of Wal-Mart). And it will need to lead, as unions in Brazil, South Africa and Korea have done, seamless campaigns of militant, focused politics from workplace to community and ballot box with a clear sense of class interests. And it will have to open up the union to more democratic decision-making to reflect the values it advocates for society. The small internal movement for change in SEIU cheers Mary Kay Henry’s proposed new fight for equality, but thinks the union is inconsistent in its actions and thus will be less effective. “How are we going to lead a popular economic movement where inequality is the issue of our time and we’ve got such income inequality in our union?” asked convention delegate Larry Bradshaw, who wants the union to limit the salaries of local union officials, which can reach several hundred thousand dollars a year. Scholar Jonathan Metzl: White supremacy is literally killing white people.